I had been to Kottayam (Kerala) past weekend and I saw a lot of Freestyle. The car definitely stands out with the styling. Am quite surprised this is doing well since I didn't manage to see the same number of Figos. Most likely the VFM price is helping. Most likely the VFM price is helping. Plausible. On the other hand, the set of cars I would compare it with are the Elite I20 and the WRV. The Elite I20 feels a lot more upmarket and people who like premiumness (quite a lot of people who want to spend 10l otr) will not like the bland interiors of the Freestyle, top it up with the fact that the I20's diesel has excellent drive ability and the top end Asta comes with optional 6 airbags. Why would such a customer look at the Freestyle? People looking at the WRV are looking at a different segment altogether. That segment is populated with the Ecosport, Duster, Brezza, Creta, Nexon and the SCross. The freestyle is no match for these heavyweights. I really don't know which segment of customer is buying the Freestyle except for the enthusiasts. I for one was waiting for a better equipped Figo and didn't consider any other car before booking the Freestyle. The only other car I would consider would be the Polo GT but VW's legendary reliability and service reputation keeps me away. I reckon it's the same segment of buyers you are comparing with, but those who would be happy to pocket a cool 3Lakh for a fractional compromise. Actually, an informed buyer may not even consider it a compromise --- Traction control, Hill Hold Assist, ESP are unheard of south of 10 Lakh. PS: I agree I20 looks and feels premium, can't say the same about any Honda vehicle these days. Just have a look under the hatch door of the WRV. Can any of the owners or long-term users comment on the real-world fuel efficiency of the Freestyle petrol? 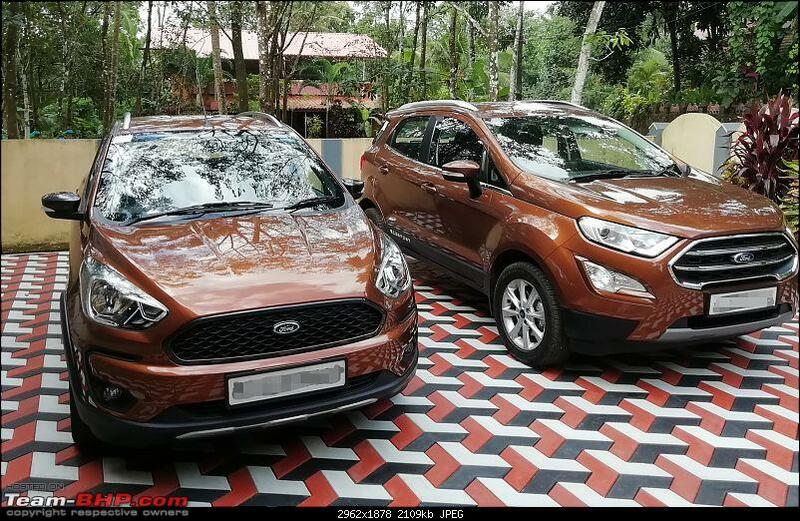 Ford Figo 1.2 delivers around 12-13 km/l in city traffic but since the Freestyle uses a 3-pot motor, I expect the mileage to be slightly better. What say? Both are valid points and I must also add that breadth-wise the footprint of the new Figo iterations is really small. There are people who have to make do with very tight parking spaces and honestly those few inches count there. It is actually a lot packed in there for that price. Don't expect anything drastic, but definitely improvement should be present as the new motor has lots of low end grunt which matters in city. Even the diesel delivers 14-16 km/l in city, and I've heard the old 1.2 going single digits sometimes in city. So if you can extract 13 from the old 1.2, 14 km/l from the new motor is doable, is what I analyse. And maybe this motor won't go into single digits is what I assume. And maybe this motor won't go into single digits is what I assume. The MID was at 8.7kmpl during my TD (instantaneous and not the average). I accept that I was primarily testing the top end of the petrol mill. But single digits seem very probable for an aggressive driving style within the city. Freestyle to increase prices marginally across all variants . And most importantly it will be coming with adjustable headrests for rear seat and body colored OVRM. .
My Freestyle currently shows 13.6 average on the MID and I'm getting 400KM for 30 litres (30.08 to be exact) T to T.
That equates to 13.3 km/l . Note: My car has done 2145 KM so far and hasn't gone for the first service yet (2500KM or 3 Months). I used to see 11.8 and 12.4 in the first couple of tankfuls . Mileage improved after the first 1200 KM. Will see whether it improves after the service. On the whole though I'm happy, it gives around 2.5km/l lesser than my old car but that is liveable. Damn. I hope we can get the backrest on the older version replaced with this new one to get the adjustable head rests. Moderators: Kindly merge with previous post. Unable to do so myself. Last edited by Gannu_1 : 20th September 2018 at 17:39. Reason: Back to back posts merged. Please use the multi-quote option (QUOTE+) while quoting and responding to multiple posts. Thanks. How does the engine feel on long drives , does it have long legs like the diesel ? 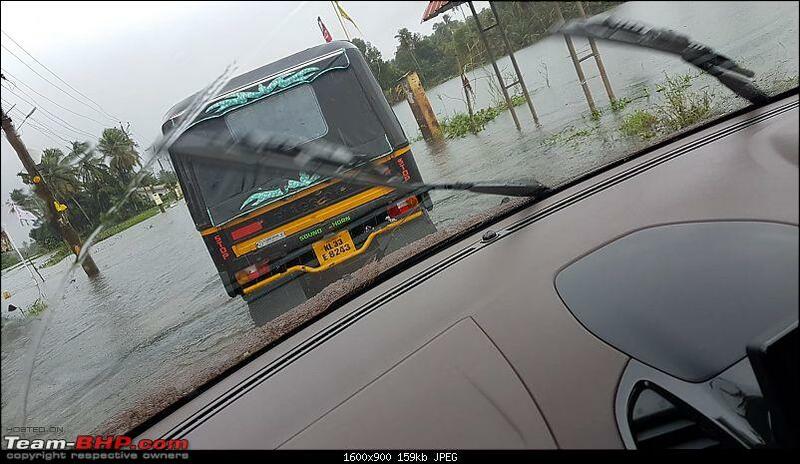 Curious to know which was your old drive that used to get 15.8 km/l in Cochin? Don't think the head rest can be incorporated without changing the full seat back. But maybe if you so need it, change the whole seat back. Good move by Ford to provide rear adjustable headrests. There were so many posts in this review thread about the lack of it. I would be glad if they add ISOFIX mounts also. This guy from your city claims to do such kind of alterations. May be you can check with him once? It all started in the beginning of this May. We were in ford show room to take delivery of my new Ecosport and my uncle's eyes fell on the brochure of Freestyle. Before proceeding any further, a few words about my uncle. He is a retired officer from kerala state government service and he owns a 2007 Maruti alto. Like many government officials, he has always been a 'play safe' kind of guy, who could never think beyond marutis. Came the month of May and at this point of time, he was considering buying a premium hatchback. Needless to say, Baleno was in the top of his list. 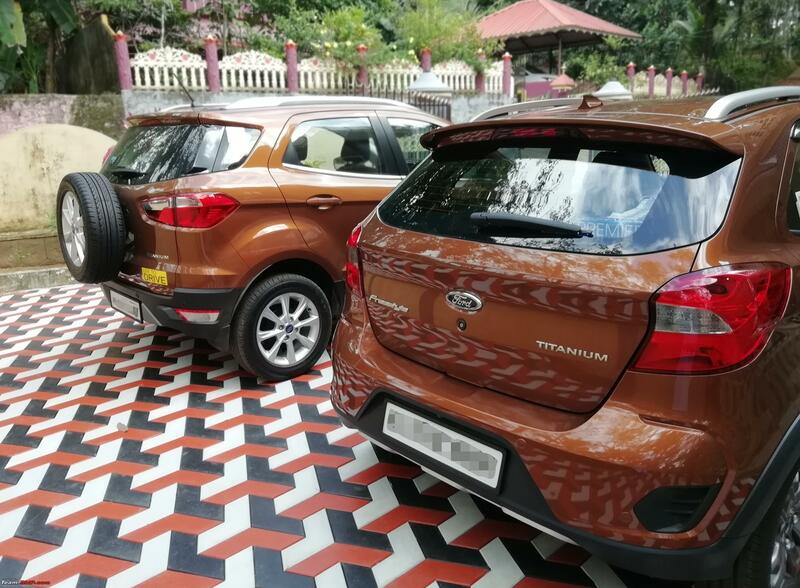 After seeing the freestyle brochure (the show room didn't have a demo car at that time) and the canyon ridge colour of my Ecosport, his priorities started changing. He took a test drive later that month and booked a titanium petrol canyon ridge on the same day. He took the delivery of car in july and I got the chance to drive it in August. 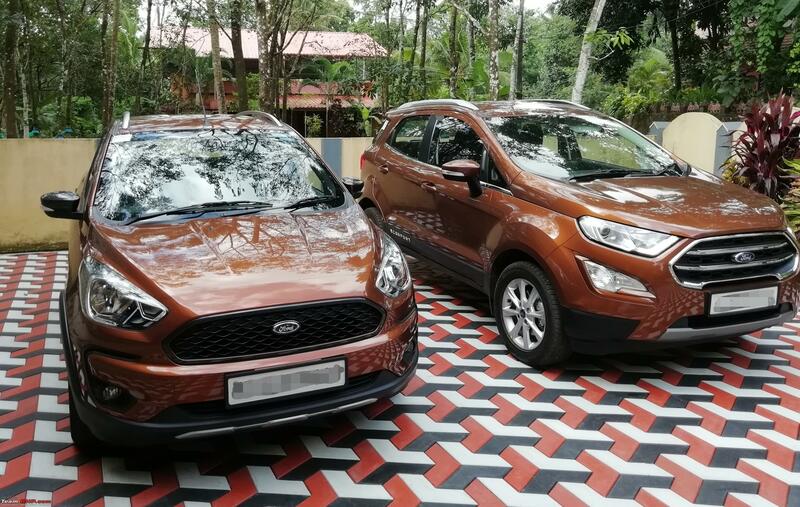 From an ecosport guy's point of view, the first thing I felt was the lightness of the door. 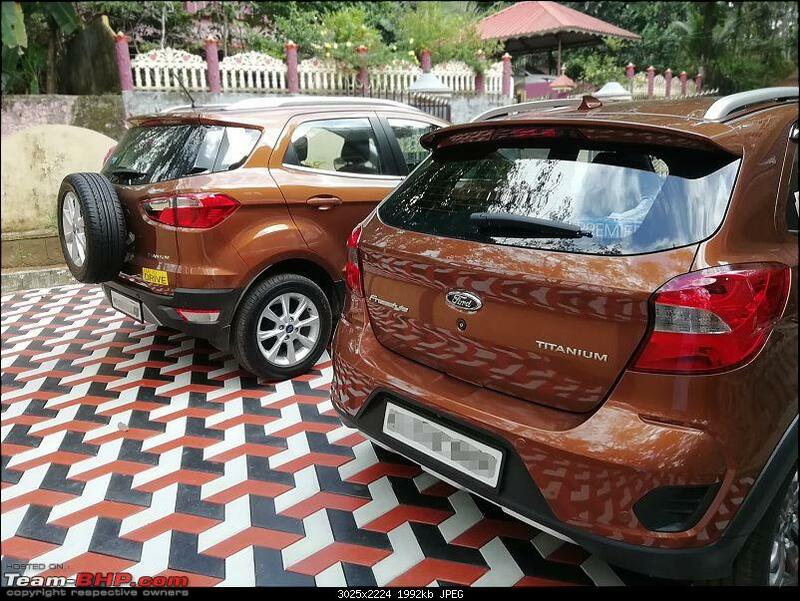 The build quality is nowhere as strong as ecosport or any old ford cars, for that matter. Started the vehicles with windows rolled down and the second thing I noticed was engine noise. It is far more noisy than all other petrol engines in its segment. But all these bad bits ended once I rolled up the windows, switched on the AC, put the selector in 1st gear and moved the car. Noise insulation inside the cabin is nice and seating position is almost SUV like. Power delivery and handling also is equally impressive and my doubts about uncle's choice of car immediately faded away. 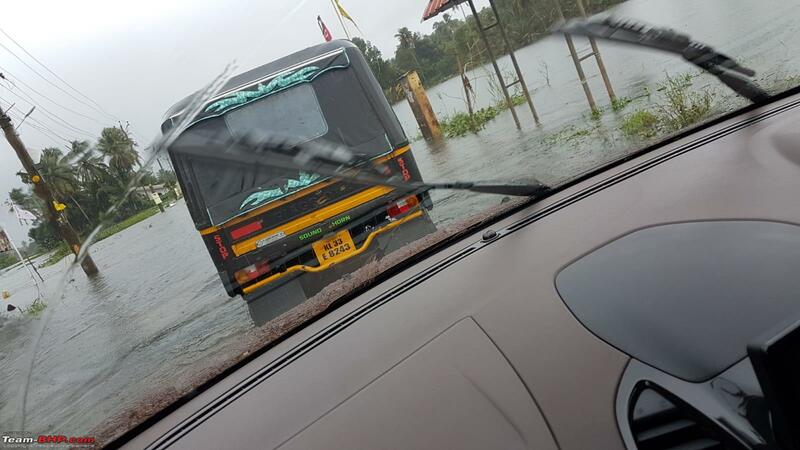 During the recent flood in kerala, we had to drive to a place 90 kms away to pick up our sister from her college. Most of the roads were water logged and we were frequently diverted to village roads by locals because of the closure of main roads. Freestyle behaved extrmely well in running board- deep waters and muddy roads. The decent ground clearance also came into our rescue in many occasions. Last edited by benbsb29 : 21st September 2018 at 05:08. Reason: Edited post for readability. I used to have a 2007 Alto. That did manage to give between 15 to 16 km/l . Changing the seatback is not an issue if the Ford ASC is ready to do it. I don't mind spending money if it improves the comfort and safety.